Allergy Advice: Contains Sunflower Seed, Milk. Ingredients: Sunflower Seed (89.55%), Salt, Star Anise, Nucleotide Seasoning, Licorice, Sweetener (E954), Milk Flavour. 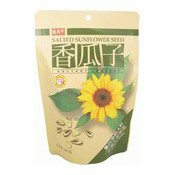 Simply enter your details below and we will send you an e-mail when “Salted Sunflower Seeds (香瓜子)” is back in stock!